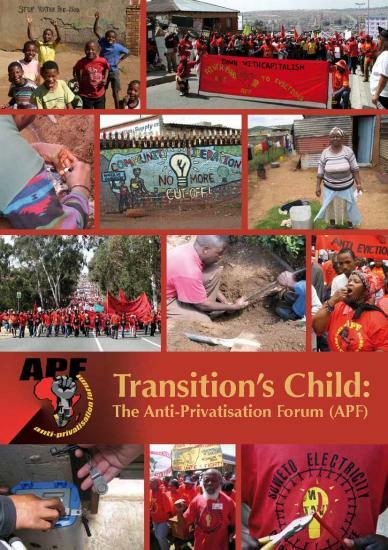 This report is based on an oral history and document collection project on the South African social movement, the Anti- Privatisation Forum (APF), undertaken by the South African History Archive (SAHA) in 2010 and 2011. In line with SAHA’s commitment to capture neglected histories within South Africa and contest ‘histories from above’, this project aimed to record stories of the APF’s struggles for justice in direct response to the political and socio-economic conditions in which many poor communities have found themselves in the post-1994 era. In addition, the project was an attempt to explore the challenges and complexities of documenting, archiving and making accessible histories of community-based, often decentralized, social movements in South Africa. and campaign materials – now archived at SAHA. The report was launched on the 31st of March 2012 alongside an exhibition at Museum Africa and an online virtual exhibition for an improved access. This project was made possible through the financial support from The Atlantic Philanthropies and the Rosa Luxemburg Foundation. Visit the SAHA archival collection on the APF.